Our team of DJs were invited to yet another party for Don-Lors Electronics. This company specializes in satellite dish installations They have been in business since 1958. The company has expanded nationally with regional offices across the United States. Their main headquarters is in the city of Livonia. It was December, which means they contacted us again for their corporate party. Their banquet hall specializes in Livonia Company Parties. The place is called Vladimir’s. Our goal was to help their staff celebrate in style while bringing in the New Year. The staff at Vladimir’s does a very good job with events. Just recently we did the wedding entertainment for the family that owns the facility. They provide all their catering on-site, and have many entree selections. The reserved us for the DJ entertainment, and it worked out perfectly. Every year the company gives away thousands of dollars worth of gifts. This is great for breaking the ice and reward your employees. Typically they will raffle these off. We offered to do the announcing, but the CEO insisted on emceeing the giveaways. He did a great job keeping the audience engaged. We tried to spice it up a bit, but playing sound effects while contests came up to retrieve their prize. For example, we might of played a track with movie fan fare or the ‘Price is Right’ theme songs. Once the giveaways were done, it was our job to get guests up and dancing. Corporate events tend to be complete different from wedding receptions. Since there are a variety of employees at these events, we typically have to play a wide mix of music to accommodate everyone. We like to take guest requests on the spot to help gauge the crowd and create our sets. Just as with any party, we want to make sure everyone has a great time. As with tradition, the company did a holiday shot with everyone. Before you know it, there was 200 people lined up by the bar doing their shot as the CEO said a few words. 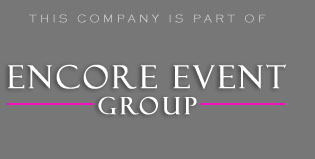 If you need help planning a company party, don’t forget to contact Encore. We know exactly what to takes to make your yearly bash a night to remember. For your convenience, we also offer wall lighting and Michigan photo booths. Bundle a package that fits with your committee’s budget and expectations. Read more about how Encore can bundle multiple services into your package by clicking the image below.